Republican Rep. Don Young suggested during a recent town hall in Juneau, Alaska, that more guns could have saved Jews in Germany during the Holocaust. "How many Jews were put in the ovens because they were unarmed?" said Young, the longest-serving member of the House. Young pinned the blame for the recent school shootings on video games and other media. 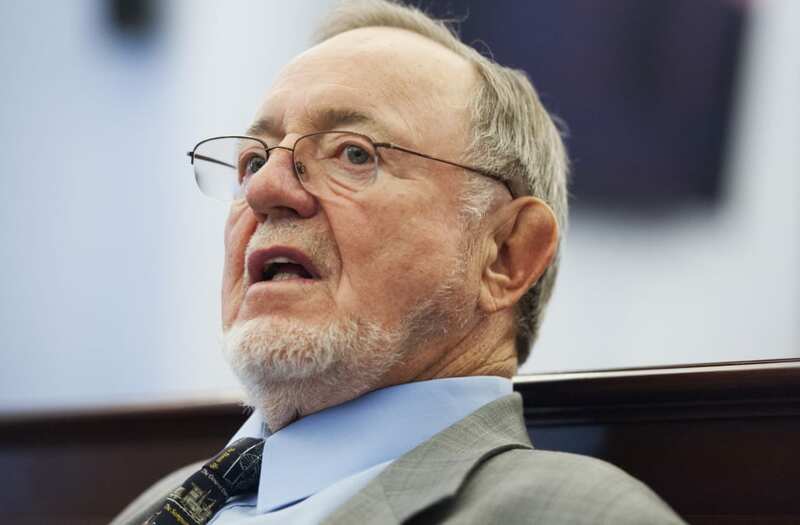 Republican Rep. Don Young of Alaska suggested that looser gun laws could have saved Jews during the Holocaust. During a recent town hall event in Juneau, Alaska, Young was asked by Dimitri Shein, who is running as a Democrat in opposition to Young, what he thought of school safety. In response, Young questioned how many people could have been saved in Germany during the Holocaust and the Russia under Joseph Stalin if guns were allowed. "How many millions of people were shot and killed because they were unarmed? Fifty million in Russia," Young said. “How many Jews were put in the ovens because they were unarmed?" The argument that gun control was a potential factor in the breadth of the Holocaust is not a new one: Department of Housing and Urban Development Secretary Ben Carson and other politicians have suggested the connection in the past, But the Anti-Defamation League has consistently rejected the idea that gun control played a factor. "The small number of personal firearms in the hands of the small number of Germany’s Jews (about 214,000) remaining in Germany in 1938 could in no way have stopped the totalitarian power of the Nazi German state," the ADL said in 2013. "When they had weapons, Jews could symbolically resist, as they did in the 1943 Warsaw Ghetto Uprising and elsewhere, but could not stop the Nazi genocide machine." Young is the dean of the House, a title given to the longest continuously serving member, and a long-time opponent of gun control measures. The Alaska Republican also pinned some of the recent school shootings on video games and other media. "Let's go back to what we've done with video games," Young said. "Have any of you seen some of those video games? Have you watched what they're watching? It is the worst I've ever seen, violence beyond anyone's imagination." Young also said that he supports President Donald Trump's suggestion to arm teachers as a way to stop shootings. Teachers want to be heard. ✊ Comment your #ARMMEWITH below!